Also see FIMETI's annual Newsletter 'Making Waves' for further information about Fair Isle's maritime environment. 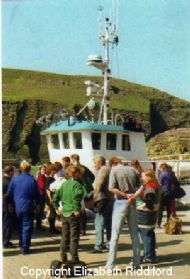 Interpretation and appreciation of Fair Isle's varied history, traditional culture and marine environment is one of the key objectives of the Fair Isle Marine Environment and Tourism Initiative (FIMETI). 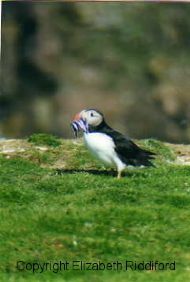 The Puffin is one of Fair Isle's best known, and loved birds. Many thousands breed on the Isle and are ashore from April to early August. Their favoured food is Sandeel. Puffins are just one of the many breeding seabird species studied by Fair Isle Bird Observatory each year as part of their Seabird Monitoring Scheme. 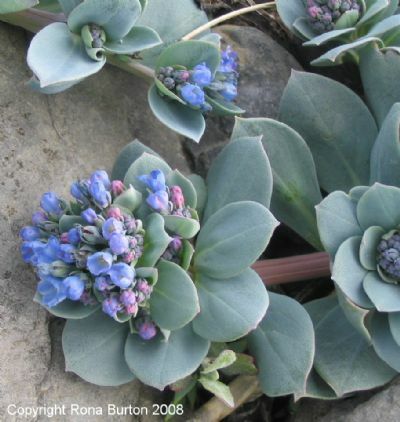 On cliffs and grassy banks, look for flowering plants such as Sea Pink, Sea Plantain, Common Bird's Foot Trefoil, Scurvy Grasses and Sea Campion. 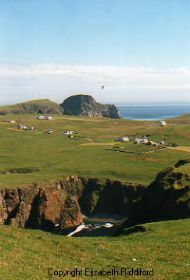 East coast of Fair Isle from Klingers Geo around to Shaldi Kliv. Littoral zone, illustrating areas of wave exposure, from exposed to moderately exposed (Marine Nature Conservation Review). Note distribution of Verrucaria maura and Xanthoria parietina lichens at the upper limit of the littoral fringe. 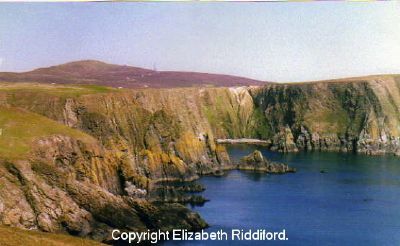 This area of coastline is the site of several of the many shipwrecks that have occurred around Fair Isle, including that of the Lessing in 1868. Further round the coast the Spanish Armada support ship 'El Gran Grifon' went aground at Stroms Heelor in 1588. 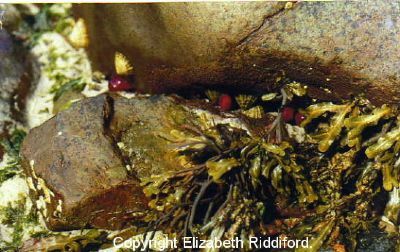 Rock pool community at North Haven on Fair Isle with Common Limpet, Beadlet Anemone, Knotted Wrack, Acorn Barnacle, Enteromorpha (Gutweed) and Cladophora rupestris. Muckle Uri Geo consists of bedrock sheltering an extensive shingle beach and large tidal pool and is notable for the nationally rare Oysterplant growing on its shingle beach, breeding Ringed Plovers, seabirds and occasional cetaceans offshore. Also look out for Toothed Top Shell, Common Periwinkle, Rough Periwinkle, Flat Periwinkle, Dog Whelk, Common Mussel, Common Limpet, Common Shore Crab, Beadlet Anemone, Butterfish, sticklebacks, chitons, shrimps and sea urchins. Seaweeds - Enteromorpha intestinalis, Knotted Wrack, Serrated Wrack and Spiral Wrack. Note lichens on the splash zone. Spear-leaved Orache Atriplex prostrata is also present, its northernmost post in UK. 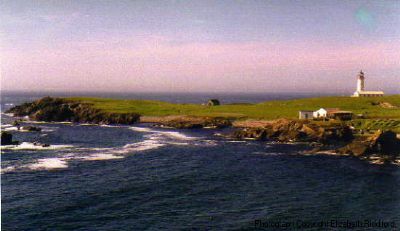 Fair Isle coastline from Tail of Uran to Kirki Geo – illustrating cultural and historical importance of the area – including old fish-drying beach, former fish store, oily kettles, boat noosts, South Harbour pier & South Lighthouse. Fair Isle's lifeline, the island mail-boat 'Good Shepherd IV' arrives home at Fair Isle's new pier, bringing essential provisions and visiting tourists. One of two stained-glass windows in the Fair Isle Kirk. These were especially commissioned by Jerry Stout of Leogh in memory of his late wife Agnes and were made on Fair Isle by Patrick Ross-Smith of Burkle. The windows graphically portray the great importance of Fair Isle's traditional maritime culture to the people of the island. 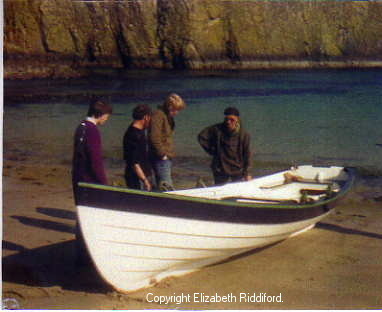 Launch of Ian Best's first yoal 'Alpha' at North Haven, summer 1988. 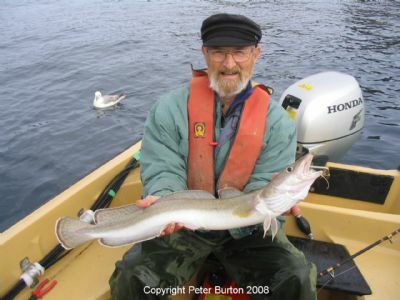 Island boat-builder, Ian Best, learnt his craft in Norway before returning to Fair Isle to rekindle what had once been a traditional activity on the Isle. Prior to this, the last big yoal built on Fair Isle was by Willie Stout at Lower Stoneybrek in 1936. 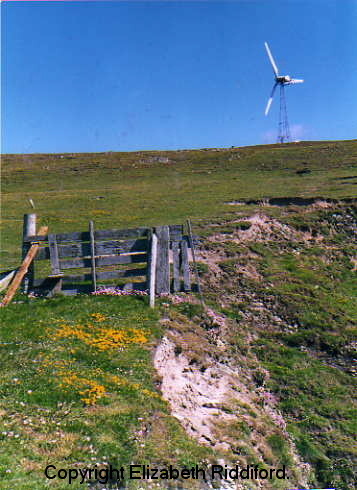 Fair Isle, a maritime community caring for its maritime resource. Coastal communities are increasingly recognising that their long-term well-being depends upon the health and quality of their marine environment. FIMETI sets out to safeguard Fair Isle's maritime resources for the benefit of its inhabitants, its visitors and the nation alike. 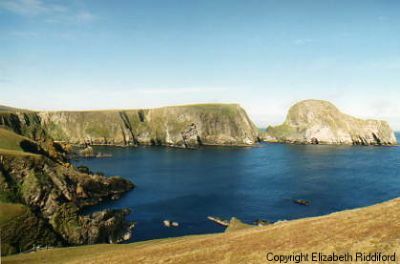 The value of Fair Isle's spectacular natural environment is acknowledged through a wealth of awards and designations such as The Council of Europe's prestigious Diploma in recognition of the island's outstanding natural beauty and cultural heritage. 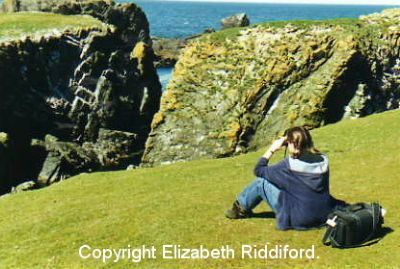 Fair Isle is also a designated Special Protection Area (SPA) with particular reference to the isle's nationally and internationally important breeding seabird species. (Please see Awards and Designations for more). Additional photographs and information about Fair Isle's maritime environment can also be found at the following links on our website's MENU bar. Text Copyright Fair Isle Marine Environment and Tourism Initiative. Photographs Copyright as indicated. All rights reserved.